The University of Notre Dame’s Basilica of the Sacred Heart will be closed from Dec. 26 (Thursday) through Jan. 17 (Friday) for renovations. According to Basilica rector Rev. Peter Rocca, C.S.C., the project will include the removal of carpeting and the installation of slate tile flooring. Father Rocca said that the Basilica will be open for the Vigil Mass at 5 p.m. Jan. 18 (Saturday). 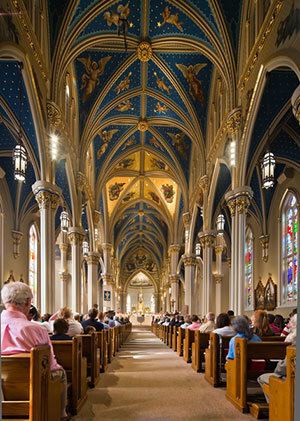 A schedule of liturgies to be held in the Basilica’s Sacred Heart Parish Crypt during the closing may be found online at campusministry.nd.edu. Originally published by Michael O. Garvey at news.nd.edu on December 16, 2013.